Online payment processing has become increasingly popular in several different types of healthcare facilities as it permits practices the ability for online billing and account management to patients with secure and convenient credit card processing. We created this whitepaper to educate facilities on how to utilize PaymentCare™ in today's rapidly evolving healthcare industry by achieving maximum productivity to manage all aspects of collections without increasing costs to your facilities. NTC Texas, a payment processor representing Elavon Global Acquiring Solutions throughout the United States today announced that its latest whitepaper, “10 Reasons for Physicians to Accept Online Payments” is available for download. Educating physicians on the critical impact online patient payments has on increasing healthcare facilities’ profitability, NTC Texas’ latest whitepaper aims to help show how your facility can benefit from the freedom and versatility of online healthcare payment processing while maintaining the robust nature of a full payment processing system as well as help make service speedier for both the patient and physician. Just like each patient has his or her own needs, each healthcare or billing office requires different services. With the implementation of PaymentCare™, managing insurance and processing payments is now quicker and dramatically simplified. PaymentCare’s online forms and user-friendly interface revolutionizes healthcare Payer and Patient Statements. "Our whitepaper covers a new aspect to online patient payments and an all-inclusive payment processing software system, highlighting how a robust solution such as PaymentCare™ can increase collections with card present transactions, how online patient payments improve the revenue cycle and accelerate payments with next day funding and how it improves efficiency by streamlining cash flow. We created this whitepaper to educate facilities on how to utilize PaymentCare™ in today's rapidly evolving healthcare industry by achieving maximum productivity to manage all aspects of collections without increasing costs to your facilities,” said Linda Borek, NTC Texas’ Chief Executive Officer. Implementing online healthcare payment processing is a remarkably affordable way to increase profitability. Getting started with PaymentCare™ automates workflows, reduces paper, and reduces bank runs. Patients can conveniently pay statements online, and physicians can easily collect and digitize payments made with bank cards and checks. 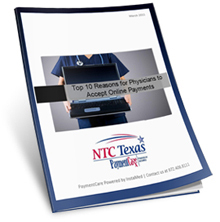 To download the “10 Reasons for Physicians to Accept Online Payments" whitepaper, please visit http://www.ntctexas.com/physician-online-payments/. To check out PaymentCare™ for your facility contact NTC Texas at http://www.ntctexas.com/contact or call toll-free 877-399-0099. Established in 2004, NTC Texas located in Las Colinas, Texas is a merchant service provider representing Elavon Global Acquiring Solutions throughout the United States and Canada. As a team, NTC Texas and Elavon deliver the most powerful transaction processing package in the industry with a proprietary network, fully redundant systems, 100% up time, superior customer service and a broad spectrum of products. Our credit card processing and other merchant services help increase revenues and decrease costs for businesses in healthcare, manufacturing, and many other industries.